Blowout Sale! Free Shipping Included! 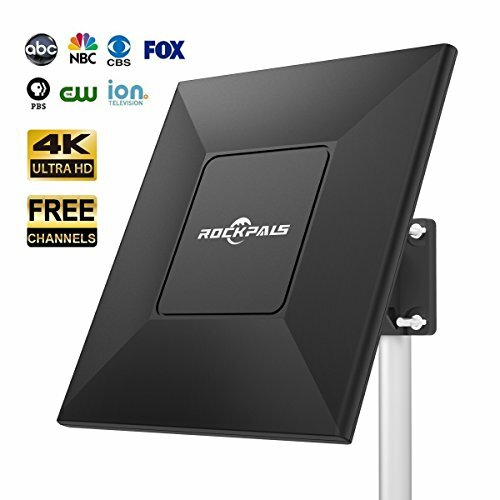 Save 56% on the Rockpals Long Range HDTV Antenna, Supports Multiple TVs - 4K HD 1080P Amplified High Reception Indoor Outdoor Digital TV Antenna - VHF UHF Channels, w/Amplifier Signal Booster & 33FT Coaxial Cable by Rockpals at Home Entertainment Centers Online. MPN: 4335091994. Hurry! Limited time offer. Offer valid only while supplies last. WATCH HDTV SHOWS FOR FREE -- Break free from cable and the ever-increasing monthly fees that go along with it, without giving up on your favorite HDTV shows thanks to this HDTV antenna. It can pick up free broadcast High Definition TV signals like ABC, CBS, NBC, PBS, Fox, and more. MULTI-DIRECTION RECEPTION -- You will get more channels that the traditional one in the attic was unable to. This antenna offers a reception range of up to 60 miles (or more, depending on location). Its tightly integrated 15dB amplifier helps ensure best-in-class performance. NOTE: 1) Before you buy, visit the website to see what channels are available in your area. ► ► ► http://dtv.gov/mapsC .. 2) Channel reception will vary depending on what's being broadcast in your area, how far away you are from broadcast towers, and your surroundings (i.e. obstructions between you and the towers). WEATHER & LIGHTENING RESISTANT -- It delivers digital television channels in stunning HD on both UHF and VHF spectrums. Being weather and lightening resistant, it can withstand even the harshest of outdoor conditions, and delivers the same high-quality performance on sunny days as it does during inclement weather. SLEEK & SIMPLE SET-UP -- Totally tools-free installation! It weighs just 3 pounds, small enough to be mounted in an attic or on the wall, rooftop, or balcony, or it can be mounted outside (inconspicuously, thanks to its compact size and the ability to position the mast close to the side of the house). If you have any questions about this product by Rockpals, contact us by completing and submitting the form below. If you are looking for a specif part number, please include it with your message.